American Ballet Theatre - Firebird and Afterite Event homeCustomer reviews HamiltonThe PromNetworkTo Kill a MockingbirdKiss Me KateHadestownOklahoma! 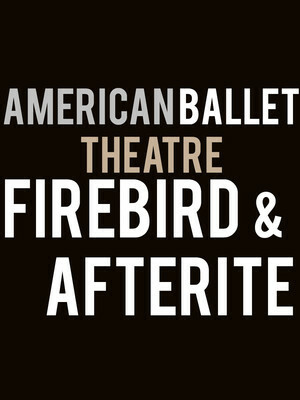 Why See American Ballet Theatre - Firebird and Afterite? Russian native Alexei Ratmansky, and choreographer Wayne McGregor share the stage for an evening of enchanting choreography and intoxicating scores. Former ballet dancer, Alexei Ratmansky, is the current Artist in Residence for the American Ballet Theatre, and invites you to witness his breathtaking choreography in Firebird; a magical tale which features a legendary creature who aids two noble lovers, as they try and overcome an evil sorcerer. This incredible piece is set to Igor Stravinsky's score. One of the most well know choreographers of the 21st century, Wayne McGregor, embarks on his first piece of choreography for American Ballet Theatre. Afterite showcases McGregor's unique style and movement, making him the perfect candidate for the ABT stage. Sound good to you? Share this page on social media and let your friends know about American Ballet Theatre - Firebird and Afterite at Metropolitan Opera House. Please note: The term Metropolitan Opera House and/or American Ballet Theatre - Firebird and Afterite as well as all associated graphics, logos, and/or other trademarks, tradenames or copyrights are the property of the Metropolitan Opera House and/or American Ballet Theatre - Firebird and Afterite and are used herein for factual descriptive purposes only. We are in no way associated with or authorized by the Metropolitan Opera House and/or American Ballet Theatre - Firebird and Afterite and neither that entity nor any of its affiliates have licensed or endorsed us to sell tickets, goods and or services in conjunction with their events.